It’s Tuesday (and my birthday 😀 ) so guess what that means? Time for another November Birthday Bash Giveaway! This week’s prize is a tasty Grilling Spices Gift Set, courtesy of FreshJax out of Jacksonville Florida. 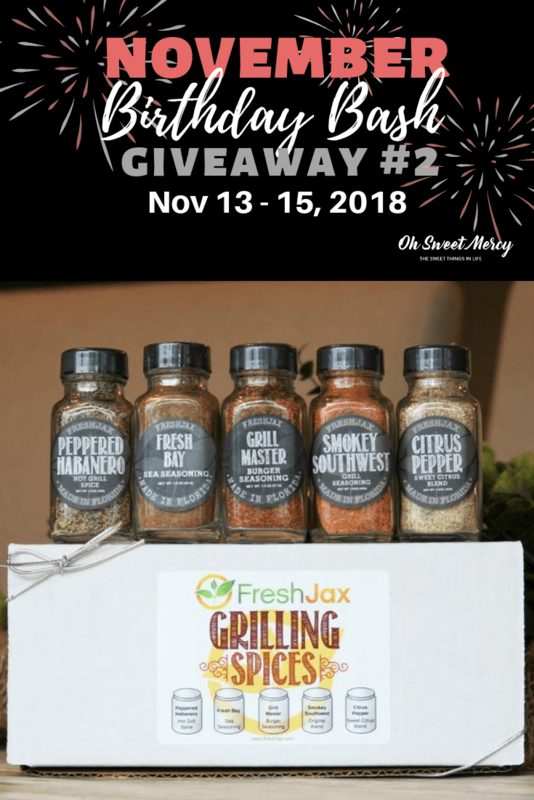 Keep reading to learn why I love FreshJax seasonings and enter the giveaway at the end of the post. How in the world did that happen? I mean that’s pretty darn close to 50. FIFTY. Spice It Up And Stay Satisfied! 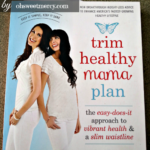 Feeling satisfied while following a healthy diet plan, like Trim Healthy Mama, is essential. 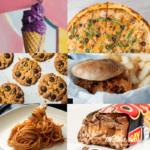 When we feel satisfied then unhealthy junk foods are less tempting! So making sure your foods are well-seasoned and flavorful is key. Especially with THM E and FP meals, am I right? Those Fuel Types are both low in fat. 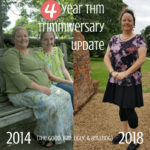 Fat helps us feel satiated so when it’s missing it’s easy to feel let down a bit. But when we add plenty of delicious, flavorful seasonings to our recipes our focus turns to all that yummy tastiness instead. Say Hello To FreshJax Spices. I’d like to introduce you to FreshJax, a small family-owned company in Jacksonville Florida. They hand craft their organic seasoning blends right here in the good ole US of A. They don’t put any funky ingredients in their products, either! Have you ever been shocked to discover things like MSG, maltodextrin, and wheat flour in your seasonings? You won’t find them in FreshJax products. What makes FreshJax spices unique? FreshJax spices are handcrafted in small batches using only pure, organic spices, herbs, and salts. Each bottle contains 100% real food. 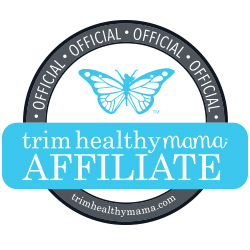 You won’t find any fillers, anti-caking agents, MSG, dyes, chemicals, or anything artificial inside. This gives FreshJax spices their delicious flavor and means you can feel good about using them. One thing to note: some of their seasonings contain salt, some do not. I’ve gotten some things a bit too salty by forgetting to check before using, then adding salt first. I recommend using the FreshJax spices first, then taste and add salt if necessary. Or read the label first, that’s also helpful! Follow FreshJax on Social Media! Our family’s favorite (so far) is their Toasted Onion Seasoning. It’s so delicious! It’s fabulous on roasted vegetables, eggs, sauces, and meats. My personal favorite is the Spicy All Purpose Seasoning. It adds a lovely kick of heat to eggs, sauteed veggies, meats, and more. I also really love the Grill Master Burger Seasoning and Citrus Pepper. 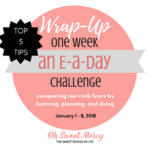 Any of those spices would work well in quite a few of my recipes, such as my Fried Okra and Blackened Salmon, Spicy Spaghetti Squash Latkes (kick up your Hanukkah celebration a notch 😉 ), Jalapeno Burgers with Sriracha Burger Sauce, and my egg white omelette that looks like the real thing. The Citrus pepper would also be delightful with my Salmon with Blueberry Sauce. 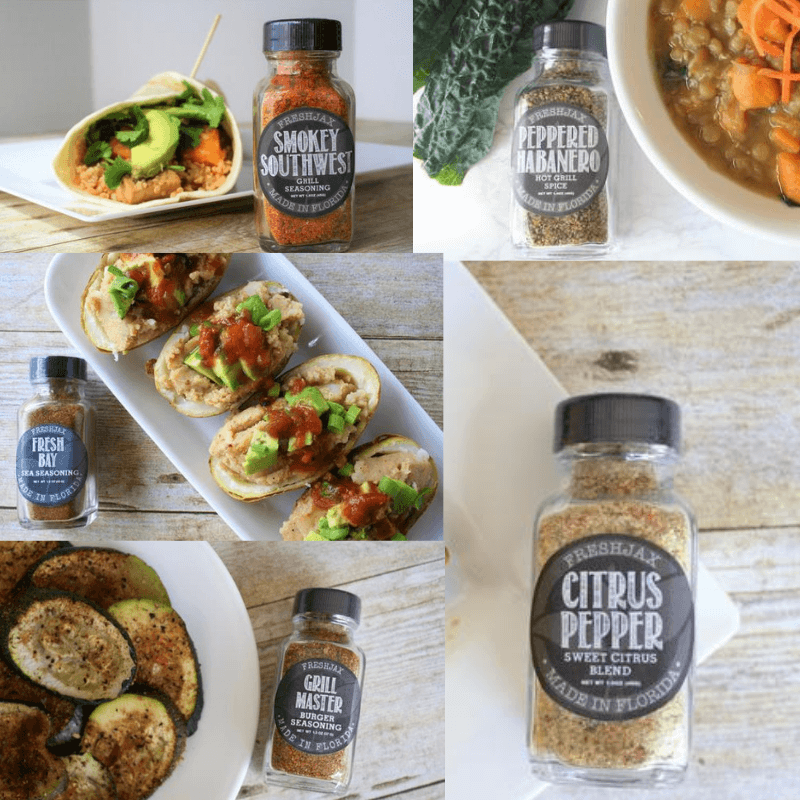 FreshJax has a ton of amazing seasoning blends on their website! They’ve also generously offered to award one lucky OSM visitor with their tasty Grilling Spices Gift Set. You’ll find 5 delicious spice blends to make your grilled fare the best around: Peppered Habanero (1.4 oz), Fresh Bay (1.5 oz), Grill Master (1.3 oz), Smokey Southwest (1.6 oz), and Citrus Pepper (1.6 oz). All come in square glass bottles with attractive labels, packaged in a gift box. These spices are friendly for gluten-free and vegan diets and are Certified Kosher. Learn more about FreshJax spices on their FAQ page. 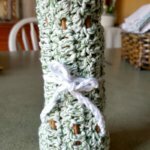 How To Enter November Birthday Bash Giveaway #2. I’m So Excited To Give One Of YOU A Gift To Celebrate My Birthday! Good Luck! « November Birthday Bash Giveaway! Celebrate All Month Long! Entered! I am feeling lucky! Good luck Linda! Thanks for stopping by! HAPPY BIRTHDAY!!!! thanks for the give away! Thanks Raia! They really are delicious, I’ve enjoyed the ones I have very much! Good luck!